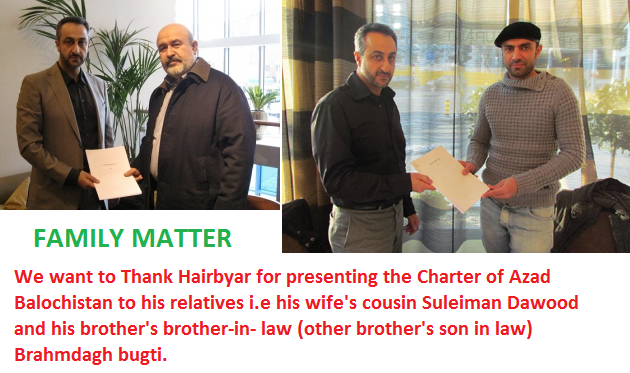 Harbyar Marri issues freedom charter to family members. WHO is he to decide on Balochistan? Imran Khan, a cricketer turn politician, is on ISI mission, met with terror suspect and BLA head, Mr. Hair Biyar Marri who is behind killing of many Middle Calss Baloch leaders, Punjabi Barbers and University teachers. The purpose and motive of this meeting was not disclosed but one can have a good guess why ISI man Imran Khan is meeting BLA head. BLA is a terrorist organization banned in UK and Pakistan. PTI chief meets Akhtar Mengal, Harbiyar Marri. There’s an increasing sense of urgency about Balochistan on the political stage, and as the violence continues, the conditions for negotiations continue to get more stringent. In a recent meeting with Pakistan Tehreek-e-Insaf (PTI) chairperson Imran Khan, Baloch nationalist leaders sent out a clear message. It’s a zero sum game now: Unless the military is kicked out of the province and abductions of Baloch people allegedly by the intelligence agencies come to an end, all other measures to address the province’s concerns will fall flat. The PTI chief met former Balochistan Chief Minister Sardar Akhtar Mengal and exiled Baloch nationalist Harbiyar Marri in a bid to appease the province’s leaders and formulate a strategy to address Balochistan’s grievances. After the meeting, Khan said such a strategy would be outlined soon. The nationalist leaders, however, remain understandably cautious. “Baloch leaders told Imran Khan that, in the presence of military and intelligence agencies on the soil of Balochistan, there cannot be any meaningful dialogue or discussion on the issue,” said a source privy to the meetings. On the other hand, it appears that Imran remains one of the few political leaders that the nationalist leaders are still willing to talk to. “Mengal, Marri and other leaders conveyed to Imran that … the PTI chairman was amongst those leaders where the trust deficit was at a minimum,” the source added. The meeting also seems to have spurred Imran to switch his party’s focus from corruption to the Balochistan issue. It is important to note that PTI’s next rally is scheduled to take place in Quetta. Taking his party members into confidence over his meeting with the Baloch leaders, Imran is quoted to have said that the matter should become the number one priority for PTI, adding that the issue is seriously threatening national integrity. He directed the party’s think-tank to come up with meaningful proposals on Balochistan, which will be made part of the PTI’s upcoming manifesto. One of the more radical proposals on the table is to shift the federal capital and government to Quetta in order to enable massive and quick development. However, the source added a caveat. According to the source, Imran could not assure the Baloch leaders if he could a play a role in addressing the grievances raised by them at the meeting. In April, the source added, the PTI will hold a public meeting in Quetta where it will announce “complete solidarity with the Baloch people and unveil their strategy on the issue of Balochistan”. “The party is gearing up for the rally and it will be a symbol of national integration as many Baloch leaders will be invited,” said the source. Imran, however, will be addressing a crowd tough to please. “At the moment, even moderate Baloch like Mahmood Achakzai are hard to convince. (The leaders) want to talk to Imran Khan but only if he can guarantee the withdrawal of troops from Balochistan,” the source emphasised once again. Published in The Express Tribune, February 19th, 2012.